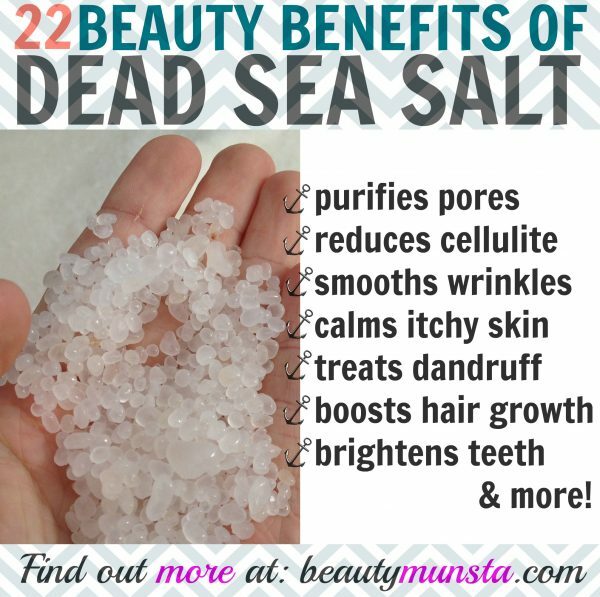 22 Benefits of Dead Sea Salt for Skin, Hair & More - beautymunsta - free natural beauty hacks and more! In this article, discover 22 beauty benefits of dead sea salt for skin, hair & more! Since ancient times, the waters of the Dead Sea, have been renowned for their therapeutic properties and healing qualities. People of long ago used it to naturally treat a variety of illnesses and skin conditions. What makes the Dead Sea special is its high salt content which is super rich in minerals. 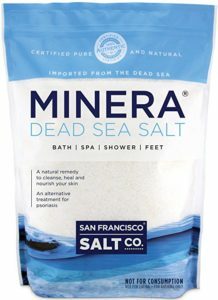 Dead sea salt contains a boatload of minerals, including magnesium, calcium, sulfur, bromide, iodine, sodium, potassium and zinc, which are easily absorbed by the skin. 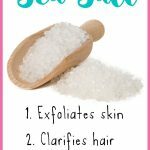 Because of its dense mineral content, dead sea salt is extremely bitter and isn’t edible but it does have INCREDIBLE beauty benefits for skin, hair and more as you’ll find out below! But first, let’s look at some of the minerals in dead sea salt and what makes them beneficial for beauty! ► Magnesium –Promotes cell metabolism, speeds up healing of skin tissue, soothes damaged skin, protects skin from microbes that cause allergies. ► Zinc – fights acne, protects skin from sunburns and harsh winds. Instead of planning a trip all the way to the Middle East for a soak in the Dead Sea, you can get a 2 pound pack of 100% pure, fine grain dead sea salt here. To have a dead sea salt bath, place a handful of dead sea salt to hot running bath water and let it disperse. 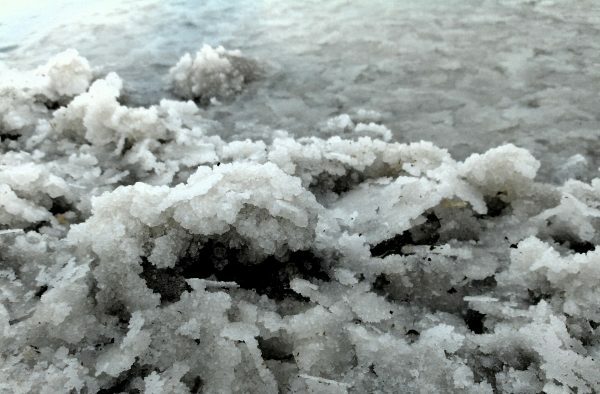 Now that we’ve looked at the incredible minerals in dead sea salt and their properties for skin, don’t you feel like it’s a miracle ingredient that you gotta use by all means? I sure did! Let’s move on to look at all 22 benefits of dead sea salt for skin, hair & more! With its detoxifying and disinfectant properties, dead sea salt purifies the skin’s pores by driving out all the gunk including dead cells, dirt, pollution, stale sebum and germs that collect and form acne, blackheads and white heads. Anytime you feel like squeezing out every pore on your face, stop and use this gentle but super effective dead sea salt scrub instead: add 1 tsp of dead sea salt & 1 tsp of honey in a small bowl. Mix together and scrub this on your face. Wash off with lukewarm water and pat dry. 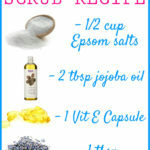 This scrub will get your pores squeaky clean in no time! Dead sea salt has a slight abrasive texture that helps in sloughing off flakes and dead cells on the skin’s surface. Instead of using store-bought scrubs, use dead sea salt combined with a moisturizing ingredient like coconut oil or raw honey for clean, soft and smooth skin! 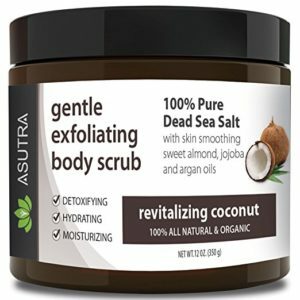 If you’re looking for a good dead sea salt scrub, you can purchase Asutra’s Gentle Exfoliating Body Scrub. It has detoxifying, hydrating & moisturizing properties! If you have chronic dry skin, using dead sea salt can help improve your skin’s lipid barrier and help replenish its natural moisture. Try this dead sea salt lotion on your skin after a shower for well-hydrated skin! Got cystic acne or itchy bacne? Start using dead sea salt! We already know it contains a lot of zinc & sulfur, that have both been shown to be a very effective acne treatment when used topically, so use it as a gentle scrub or soak in a bath to disinfect and cleanse acneic skin! Soaking in a dead sea salt bath can help soften up the rough areas of your body like the elbows, knees and heels. If you have cracked heels and calluses on your feet, prepare a foot bath by filling a tub with hot water, adding ¼ cup of dead sea salt and a squeeze of half a lemon for extra exfoliating properties. Now relax your feet in this water for softer heels. Say goodbye to dandruff with dead sea salt! Its sulfur & sodium content helps deep cleanse the scalp of flakes while fighting off yeast overgrowth that may be the cause of dandruff. To use, make a scalp scrub by combining 1 tbsp of fine grain dead sea salt, 1 tbsp of oat flour and enough honey to form a paste. Now massage this onto your scalp, wait for 5 minutes then rinse off well and wash your hair as usual. Dead sea salt reduces and soothes skin inflammation such as acne inflammation and inflammation associated with sunburns, eczema & psoriasis patches as well as atopic dry skin. Use a little in a warm bath to help naturally heal skin inflammation. One surprising benefit of dead sea salt for skin is its anti-aging benefits! Research shows that the minerals in dead sea salt contribute to a 40% reduction in the depth of wrinkling of skin! They not only ward off pro-aging free radicals but also help exfoliate, hydrate, detoxify and soften skin, thereby promoting youthfulness. Hives, itchy skin, weird red bumps, dermatitis and other skin allergies can all be calmed and healed using dead sea salt. The rich magnesium and bromide content help soothe skin while keeping away allergenic elements and microbes that cause negative skin reactions. 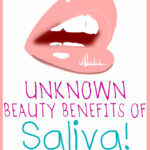 Banish bad breath with a mouthwash containing our fav dead sea salt! In a bowl, add 1 tsp dead sea salt, 1 tsp baking soda, 1 tsp xylitol (sweetener + fights cavities & freshens breath) and 4 drops peppermint essential oil. Now add ¾ cup of warm water. Mix well then pour into a bottle. Use as mouthwash for fresh breath. 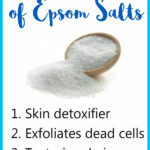 Warm baths with a handful of dead sea salt added can improve eczema by exfoliating the dead cells and flakes, soothing the itch as well as disinfecting eczema patches and relieving the pain. The miracles of dead sea salt even help prevent hair loss and boost hair growth! How? Well, first off the minerals like sulfur, a source of amino acids and protein, which improves hair strength and boost hair growth. The other minerals in dead sea salt also nourish the hair follicles hence fostering formation of new hairs. Second, dead sea salt scalp scrubs increase blood flow to the scalp which is known to stimulate hair growth. Lastly, dead sea salt is known to relieve stress, which is a major cause of hair loss in both men and women. Did you know: the Dead Sea is called so because marine life cannot exist in it due to its extremely high salt and mineral content! Using cellulite cream and seeing no results? Toss it aside and start soaking in dead sea salt baths. The minerals help detoxify the body from the outside. Draw a hot bath, add dead sea salt and soak for 20 minutes. The minerals released from the salt not only break down the old fat cells that are responsible for the dimpling effect but also help get rid of toxins by assisting in proper lymph flow. Large pores can be reduced by using this simple dead sea salt toner: Add 1 tsp of dead sea salt to a 4 oz spray bottle, now fill it to the top with warm distilled water. Shake very well and spray onto your skin after cleansing. Watch your large pores shrink in size! 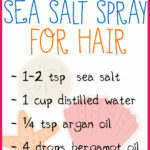 Make a texturizing hair spray with dead sea salt for wavy beach hair! All you need is to combine ½-1 tsp (depends on how wavy you want to go) of dead sea salt, 1 tsp of coconut oil and 1 tsp of aloe vera gel in a 4 oz spray bottle. Fill it up with warm water, add 2 drops of peppermint essential oil (as a preservative + refreshing scent!) and shake well. Spritz on your open hair and scrunch it up with your hands to form wavy hair! Water retention not only causes puffy skin but also makes you look…well puffed up. One way to reduce water retention is to actually drink more water which helps the excess water drain out through your bladder. Another effective way is by taking dead sea salt baths, of course! The minerals, especially potassium which is well-known for getting rid of water retention, help relieve excess fluid from the body. With regular dead sea salt baths, you can actually clear those awful itchy psoriasis patches forever! A number of studies have proven that dead sea salt has a tremendous healing effect on psoriasis. According to Everyday Health, people soaking in the Dead Sea get immense relief from a combination of the mineral-rich water, sunlight and oxygen-rich air. Give yourself a soothing dead sea salt bath by soaking in hot or warm water with about a handful of dead sea salt. Another great benefit of dead sea salt for skin is it’s itchy skin calming properties. It not only disinfects skin getting rid of itch-causing microbes but also soothes the pain from excessive scratching. Ingrown hairs are the bane of smooth skin. What you can do to prevent them and get rid of existing ones is using a gentle but effective scrub: combine ¼ cup dead sea salt & 3 tbsp grapeseed oil in a bowl. Now cut open and empty a chamomile tea bag and mix well with a spatula until well combined. Scrub this onto your skin in the shower before shaving for smooth skin and no more ingrown hairs. One of the miraculous benefits of dead sea salt for skin that no one seems to readily accept is its stretch mark erasing abilities! It really works in fading stretch marks over time! Use this scrub and see results fast: Combine ½ cup dead sea salt, ¼ cup shea butter Nilotica (the kind linked to is the one that works), 15 drops lavender essential oil in a bowl. Transfer to a mason jar and keep in a dark place for storage. Apply this scrub everyday on wet skin before showering. Make sure not to get any water into it. Forget the whitening strips and make your own dead sea salt teeth whitener that will leave you with a radiant smile, no kidding! Try this out: get ½ tsp baking soda, a pinch of dead sea salt and enough water to form a paste (don’t make it too watery). Now mix these all up with your toothbrush and apply it on your teeth (first wipe your teeth with a paper towel to remove saliva so it’s easier to apply). Leave it on for a minute or two then rinse off well. Do this once in a fortnight or even once a week if your teeth aren’t too sensitive! All the ingredients work in removing yellow teeth stains and fighting off plaque-causing bacteria as well! Do you have weak, brittle, yellow and softish nails? 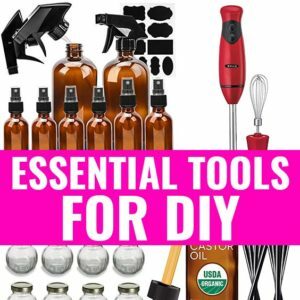 Peeling cuticles as well? Then it’s high time you did a nail soak with dead sea salt. In a bowl, mix up 1 tsp dead sea salt, 1 tsp lemon juice, 2 tbsp water and ½ tsp olive oil. Soak your nails in this solution for 5 minutes. You can do this while watching TV to kill the boredom. 😉 After 5 minutes, scrub your nails with a nail brush then rinse them in warm water and marvel at their brightness! Please do not shave your skin before soaking in a dead sea salt bath because it will sting like crazy! Also, make sure dead sea salt doesn’t irritate your skin by first using only small amounts, for example, instead of a handful of dead sea salt in your warm bath water, go for half of that or even less to see how your skin handles it.